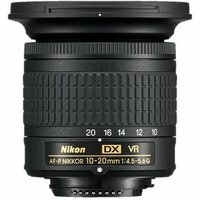 The Nikon 10-20mm f4.5-5.6 G AF-P DX Nikkor Lens expands your creative options with an ultra-wide-angle zoom lens that's built to travel. Expand space, exaggerate perspectives, and create striking compositions. No more stepping back to fit in sweeping views, and the minimum focus distance of 0.22 m lets you capture close-ups in which your subject fills the frame.